The Legris company produces the 90 degree elbows or "Legris elbows" that are used to build the proton pack. They are used, essentially, to connect the different colored hoses you see on the Proton Pack to another area on the pack where the other end of the hose leads to. The Legris elbows used on the Proton Pack are all the same type and size, and appear throughout the overall pack, to connect the hoses. 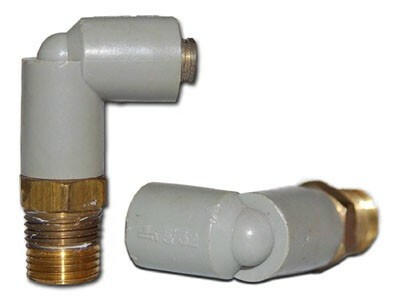 In some instances, you can see, from the reference photos, that one end of a hose connects to a legris elbow, and the other end connects to a brass fitting. 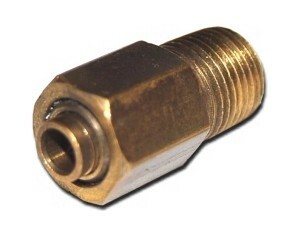 The brass fittings are made by Legris and are known as "straight male connectors". The 5/32 hose fits into them, just like they fit into the Legris elbows. They are mentioned here because of the interconnected nature of the Legris elbows, to the hoses, to the brass fitting. 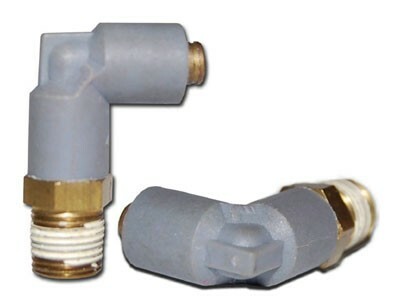 In addition to the brass fittings, the mention of the hoses is essential to understanding where the Legris elbows are located and what size they are. The hoses coming out of all of the Legris elbows are 5/32 fractional inch size, and so is the size of the Legris elbows. 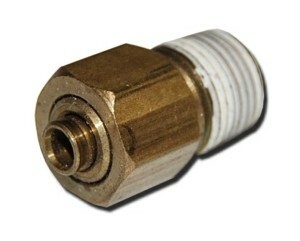 The other side of the elbow has a 1/4 or 1/8 inch thread or NPT, which is made of brass or steel. In the Legris catalog, the part number is 3109 desribed as: male elbow- fractional inch tube to NPTF and the type used on the Proton Pack is on page F6. this is noted because under the part number 3109 there are different variations, but all of them will look close enough and fit the 5/32 hose. Look at the reference photos and you will know what you will need. There are two styles of Legris Elbows found on the Proton Packs. Most Ghostbusters 2 packs also use this version of the elbow as well. This style is more commonly found on stunt packs, but has been documented on at least one GB2 hero pack. This version was most likely manufactured between the 4mm 1st generation elbows and the 4mm 2nd generation elbows. This style has been found on at least one GB2 stunt pack. There are three elbows per Proton Pack. One located on the bottom of the Ion Arm with yellow 5/32 tube running from it to the small resistor on the side of the Ion Arm. One located on the HGA with red 5/32 tube running to the Legris straight connector on the side of the Attenuator. One located on the side of the Cyclotron with 5/32 red tube running to the Legris straight connector on the side of the Attenuator. Two 5/32 Legris banjo elbows are found on the end of the Proton Gun barrel with red 5/32 tube running between them. The Legris style elbow is a feature of the Ghostbusters 1 packs, but carried over to one or two of the GB1 packs that were refurbished and used in Ghostbusters 2. Banjo elbows are also used on the Ghost Trap Pedal, but it is currently unconfirmed if a Legris style banjo elbow is used on the GB1 pedals. Legris was also the company responsible for manufacturing the Nycoil banjos used on Ghostbusters 2 Proton Packs and Ghost Trap Pedals. The correct model Banjos have been updated with a Nickel-Plating over the brass. Sadly, they are now a discontinued product. The current Legris Banjos are more round in shape and bear almost no resemblance. 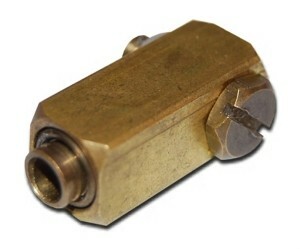 Originally thought to be Alkon connectors, and still listed as Alkon connectors on some plans, the correct Legris straight connectors were identified by namebrand. 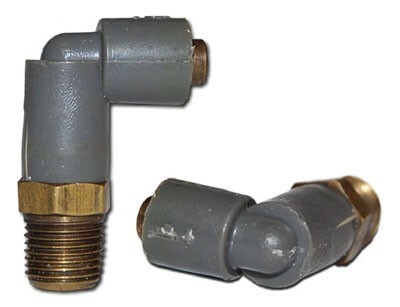 There were, at least, two lengths of these fittings produced, a long and short version. The longer version is believed to be the correct one. They are located on the side of the Attenuator with red 5/32 tube running from the elbows on the HGA and Cyclotron. A straight connector is also used on the Ghost Trap pedal.